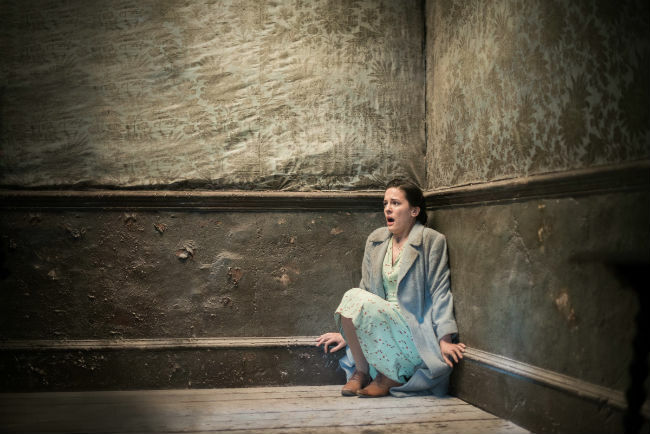 NEW YORK (CNS) — Though far friendlier than the 2012 movie to which it serves as a sequel, “The Woman in Black 2: Angel of Death” (Relativity) makes for a dull horror outing. Director Tom Harper tones down the original’s troubling theme of children lured to suicide, and Jon Croker’s screenplay excludes all objectionable language. Yet, while their mostly decorous follow-up provides the occasional start, it fails to excite much interest. Roughly four decades forward in time from the Edwardian-era disturbances of the last go-round, the Nazi Blitz is forcing the evacuation of London’s children into the countryside. One group of youthful refugees is shepherded — in tense tandem — by easygoing Eve Parkins (Phoebe Fox) and her starchy colleague Jean Hogg (Helen McCrory). Unfortunately for this ill-matched duo and their charges, the temporary dwelling to which they’ve all been assigned is a lonely, decrepit mansion known as Eel Marsh House. On the upside, though, their journey to this unpleasant abode — the primary setting of this film’s predecessor and of the best-selling 1983 novel by Susan Hill on which it was based — finds Eve crossing paths with dashing RAF pilot Harry Burnstow (Jeremy Irvine) whose base is located nearby. No sooner have the displaced kids and their guardians settled in than strange events begin to unfold. A barely glimpsed supernatural presence seems to be focusing its attention on orphaned tot Edward (Oaklee Pendergast) whose trauma in witnessing the death of his parents in an air raid has left him mute. With Harry’s help, Eve researches the estate’s past for clues about the otherworldly persona currently haunting it. The results of their investigation, however, are not especially clear or coherent for viewers who may have missed the franchise’s kickoff. This murky backstory involves mothers bearing children in trying circumstances — the absence of a wedding band among them. Together with a few images unsuitable for small fry, this aspect of the plot bars recommendation for all. Moviegoers of most ages, however, will probably find their visit — or return — to Eel Marsh House more doze-inducing than disagreeable. The film contains fleeting gore, imperiled children, some potentially disturbing images and references to out-of-wedlock pregnancy. The Catholic News Service classification is A-II — adults and adolescents. The Motion Picture Association of America rating is PG-13 — parents strongly cautioned. Some material may be inappropriate for children under 13.